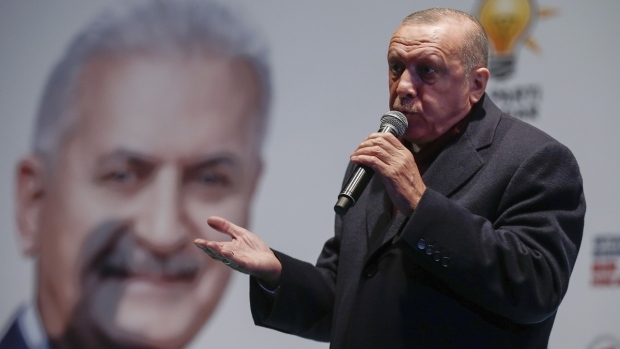 ANKARA, Turkey -- Ignoring widespread criticism, Turkish President Recep Tayyip Erdogan on Tuesday again showed excerpts of a video taken by the attacker who killed 50 people in mosques in New Zealand, to denounce what he called rising hatred and prejudice against Islam. Speaking at a campaign rally in the northern town of Eregli, Erdogan also criticized New Zealand and Australia for sending troops to Turkey in the First World War Gallipoli campaign, claiming their motive was anti-Islam-oriented. He called on New Zealand to amend its laws to ensure that the attacker is severely punished.